In everything give thanks, for this is the will of God in Christ Jesus for you. So when there is a holiday rooted in Christian history and in the work of a missionary and evangelist, we have all the more reason to join in the party. But again, we don’t do things as the world does them. The real question, then, is this: how do we celebrate St. Patrick’s Day as a Christian holiday? Did you know Patrick wasn’t even Irish? He was Scottish! Did he use the clover to teach about the Trinity, or did he chase snakes out of Ireland? Most likely not, in both cases. And here is the real kicker… St. Patrick isn’t even a saint! Well, yes and no… in the Roman Catholic faith, an individual must be canonized (officially declared a saint by the pope) in order to have the title of “Saint.” Patrick of Ireland has never been canonized, so even though St. Patrick’s Day is a Catholic feast day, he is not technically a saint. Now, as a Protestant, and following Romans 1:7 and many other passages, we believe that all believers are truly saints, both in name and in fact. So the point in moot. The larger point, however, is that there are many myths and legends surrounding St. Patrick’s Day. The best way to weed out the myths and silly traditions is to learn the real history that gave rise to the legends. To properly celebrate St. Patrick’s Day as a Christian holiday, it is important to understand Patrick himself and how the holiday came about. Here are some resources. St. Patrick’s Day by Gail Gibbons. One of the very few children’s books about Patrick that separates history from legend while also explaining the origin of several holiday traditions. Ages 5-8. Patrick of Ireland: The Boy Who Forgave (Trailblazers Series) by K. C. Murdarasi. The Trailblazers books are excellent Christian biographies for ages 7-12. Patrick of Ireland: His Life and Impact by Michael A. G. Haykin. Brief biography for all ages 12+ by a renowned historian. How the Irish Saved Civilization by Thomas Cahill. Best-selling book about Patrick’s influence on Ireland’s history and, through the Celtic monasteries, on civilazation itself. St. Patrick of Ireland: A Biography by Philip Freeman. Well-researched and accessible account of Patrick and the history of the church in Ireland. Let Me Die in Ireland: The True Story of Patrick by David Bercot. Excellent biography that cuts through the myths and reveals the striking true story. 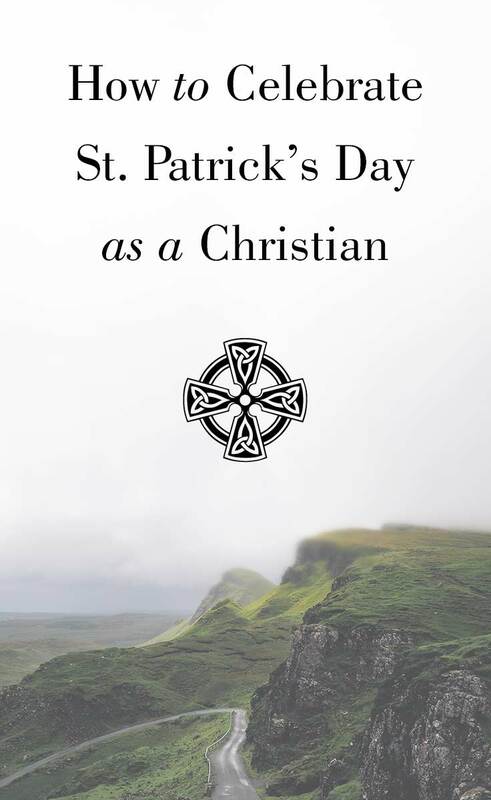 Once you have a basic idea of who Patrick was and his place in Irish and Christian history, you’re ready to move on to a Christian celebration of St. Patrick’s Day. St. Patrick’s Day, like Christmas and Easter and other church holidays, is traditionally a day set aside for worship and celebration. Many traditions hold St. Patrick’s Day services which you can attend. If your tradition does not, you can have your own small family worship service at home. Simply read, pray, and sing. Read a passage of Scripture, pray over it, and sing a worship song or hymn. There’s no real need to connect it to St. Patrick; you can certainly mention that it’s St. Patrick’s Day, perhaps read a brief biography, but the main thing is to worship God for his goodness. St. Patrick’s Day began as a feast to commemorate Patrick’s life and ministry. So have a feast! Celebrate, throw a party, decorate, give gifts. As ever, follow the example of Jesus. He was renowned as a great person to have at a feast, enjoying drink and actually a pretty good winemaker himself (John 2:3-11). Yet he was never drunk or impaired in any way in his love for others and readiness to do good. Follow your conscience, but also feel free to party like Jesus did. St. Patrick’s Day has a long tradition of enjoying the fruits of Irish brewers and stouts like Guinness. This is often traced back specifically to the Roman Catholic observance of Lent, in which Catholics prepare for Easter by fasting and abstaining from various things as a way to “mortify the flesh.” Traditionally, the Lenten restrictions are lifted for St. Patrick’s Day, which adds an extra emphasis on feasting and drinking for those who have been abstaining. For Protestants, it’s simply another excuse to enjoy good food and good drink to the glory of God, in accordance with I Corinthians 10:31. 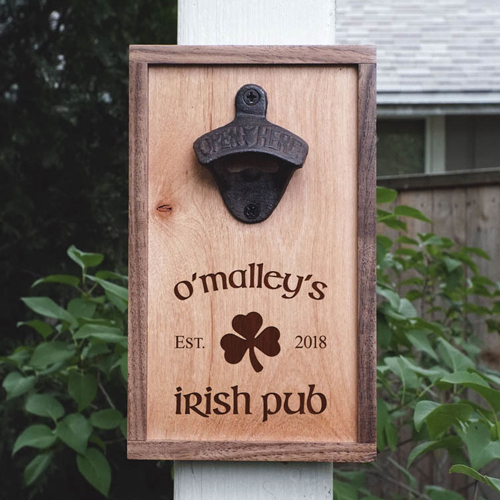 So if you throw a St. Patrick’s Day party, provide some quality Irish ales, stouts, and lagers for a celebratory feast. Drink in honor of Patrick’s missionary spirit, in honor of the expanding kingdom of Christ, and to the glory of God. Just like Patrick reached out to his Irish neighbors, this is a great holiday to invite friends and neighbors who do not know Christ. Have a few party events that include the historical Patrick and the gospel that he preached. Build relationships and spark conversation about the “reason for the season,” which for Christians, is the celebration of the advancement of the gospel and kingdom. Invite your friends, family, and neighbors to enjoy the bounty of God’s goodness, both in the feast and in Christ himself. Again, following Patrick, set yourself the task of ministering to the poor. Invite those you may not normally invite to your St. Patrick’s Day party. Make care packages to give out to those with cardboard signs on street corners (include green socks and snacks for an Irish theme). Set out a “tips” cup at the bar and donate the contributions to a local homeless shelter or pregnancy resource center. Use your imagination and situation to come up with creative ways to reach out to the poor and lost on this festive day. Take a few minutes to read about St. Patrick. This will provide ample opportunity to reflect on his missionary work, evangelism, and the good news of the Gospel. You can read some of the books referenced above in your personal time, or find a brief summary online to read at the party itself. There is a nice article on Biography.com about Patrick which you could easily print out or read from your phone. A good children’s book would also work; St. Patrick’s Day by Gail Gibbons is a good one. Reading history is a great way to see God’s hand working over time and across great nations and people groups. How the Irish Saved Civilization by Thomas Cahill is a wonderful introduction to Patrick and the work of the early Celtic monasteries. You can use this reading and research to talk with your family and start interesting conversations with friends or strangers at a St. Paddy’s Day party. St. Patrick’s Day, in popular culture, has turned into a celebration of Irish heritage. 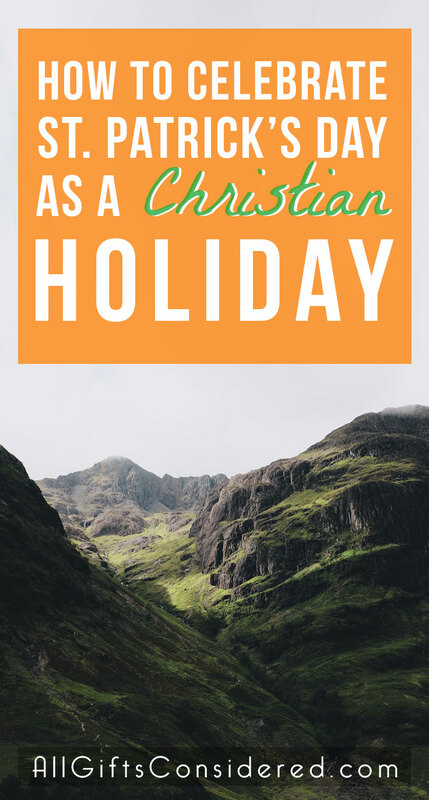 While that trend has drawn the focus of the holiday away from Patrick and his work as a Christian missionary, we don’t need to think of that as a bad thing. Remember, the good news of the Gospel is that Christ has formed a new family from every tribe, tongue, and nation. So join in the celebration of Irish culture and heritage, for those are your brothers and sisters in the people of God. With that mindset, enjoy shamrocks and wearing green and Irish music and all the rest, glorifying God for the majestic and inclusive scope of his work of salvation. As I’ve mentioned several times, Patrick was first and foremost and evangelist. Yes, he was a missionary, so by all means also use this day as a way to emphasize missions. But he, personally, evangelized. As Christians celebrating St. Patrick’s Day, let’s talk not only about Patrick but more importantly about God and his plan for salvation in Christ. Here are some resources on evangelism to encourage you in this ministry opportunity. 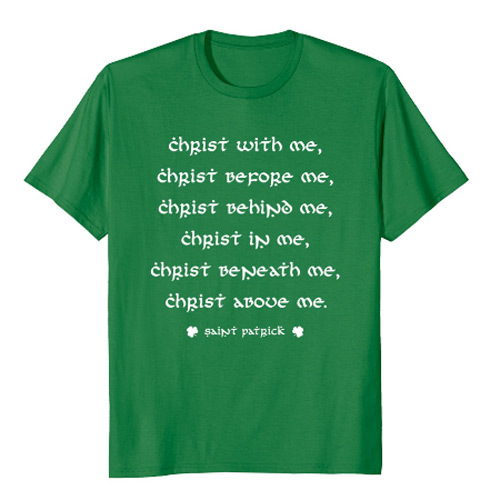 One creative way to show your Irish spirit while simultaneously showing your faith in Christ is to wear a Kelly-green shirt with the famous lines from this prayer on it. Patrick’s incredible story begins with him being kidnapped, taken to a faraway island (Ireland), and enslaved. That God would not only provide a way of escape for Patrick but also turn his heart to love and evangelize the very people who kept him in slavery – that is a work of grace! So St. Patrick’s Day is rooted in the great evil of human trafficking, and it is appropriate to use the life of Patrick as a jumping point to engage people on this important topic. IJM (International Justice Mission) is a Christian organization that works to prevent human trafficking. I haven’t worked with them personally, but they have solid ratings with Charity Navigator. Contact them to get involved, or give a St. Patrick’s Day donation. Samaritan’s Purse also has a human trafficking prevention, advocacy, and education program. I highly recommend their organization, and they also have an impressive score with Charity Navigator. Contact them to get involved, or give a St. Patrick’s Day donation. And, importantly, pray. Everything we do is from, through, and to God, so start and end all endeavors in dependence on him. Following Patrick, throw in a bit of heresy along with the gospel. JK – Just kidding! But really, heresy is serious and allowing an intermixing of the local pagan culture can definitely be one of those things that make the cross of Christ of “no effect” (I Corinthians 1:17). Patrick did enough great things to have a holiday named after him, but that does not mean we should imitate him in every respect. After all, Paul himself said “follow me… as I follow Christ.” The second part, the following Christ bit, that’s the important part. St. Patrick was a believer and a man just like us. He is an inspiration to encourage us to evangelize with conviction and dedication, but like anyone, he was a flawed human being. There is only one who is a true and lasting Hero, and that is Jesus Christ. So celebrate St. Patrick’s Day as a Christian holiday by submitting all your activities to to the service of Christ. Emphasize evangelism, rejoice in the spread of the gospel, enjoy the good gifts of food, drink, and friends, remember and honor Patrick’s life and legacy, and in all things recognize the surpassing worth of our Lord and Savior Jesus Christ.